David Morrison, of the Opelika-Auburn News, answered some questions for us. BS: The Tigers finished 7-5 overall, and managed a 4-4 record in the country's toughest divison the year after a national championship. How would you rate this year compared to preseason expectations? David Morrison: When you look at Auburn's overall record, the Tigers actually exceeded expectations. Most experts expected the mixture of youth an inexperience to yield a 6-6 season for the Tigers at best. But Auburn beat everybody it was supposed to and even snuck in a surprise win on the road over South Carolina. The one thing that's troubling about the Tigers' results this year is the number of blowouts. They lost by an average of 27.8 points this year and lost to SEC teams by an average 31.3 points. When they fell behind against good teams, they just had no way of turning things around. BS: The offense has been mostly ineffective, rotating 3 different quarterbacks. What has held the offense back this year and who are the key components to this offense? David Morrison:The main thing holding the offense back -- and, really, holding the rest of the team back -- was inexperience all over. That was the most glaring on the offensive line and at quarterback. Auburn came into the year with only 11 career starts across its offensive line, in stark contrast to its four senior starters last year. And that inexperience showed in inconsistency -- especially in pass blocking -- throughout the year. Even when they did have time to throw, quarterbacks Barrett Trotter and Clint Moseley -- both first-time starters -- couldn't make enough throws to keep defenses from keying in on Auburn's run game. Emory Blake is a huge part of the Tigers' pass game, and when he went out for three weeks with an ankle injury, the Tigers' pass game came to a standstill. First-team All-SEC back Mike Dyer was also a huge part of the offense this year, but Auburn will have to do without him for the bowl. He's been suspended for a violation of team rules. BS: The defense has had good moments, but has struggled at times. What is the strength of this defense and who are the key players? David Morrison: The strength of the defense is the defensive end play. Corey Lemonier had a breakout season at rush end, recording 9.5 sacks on the year, but struggled keeping up a high level of play for longer than a couple snaps at a time. Nosa Eguae provided a counterpoint at strong end, chewing up blocks and helping in the run game. Of course, the line as a whole didn't have the best year because it was often outplayed by stronger, older offensive fronts. Senior middle linebacker Eltoro Freeman stepped into the starting role in the middle of the season and has provided a jolt of energy to the linebacking corps. Outside linebacker Daren Bates -- the team's leading tackler -- has played better as of late, and safety Neiko Thorpe -- its second-leading tackler -- is looking more comfortable at safety each game after moving over from cornerback before the season. 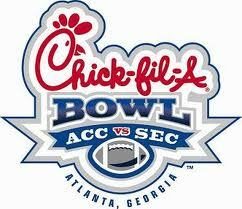 BS: If you could pick one player to have a breakout performance in the bowl game, who would it be? David Morrison: It's got to be freshman running back Tre Mason, especially with Dyer's suspension. The Tigers still have Onterio McCalebb to carry the ball, but he makes most of his living outside the tackles. Mason has the bulk to go into the line and get the tough yards and he should get ample opportunity against Virginia. Auburn started stepping up his play count toward the beginning of the year, but a hamstring tweak in the middle of the season set him back a bit. Mason's healthy now, and he should get every chance to prove himself on New Year's Eve. Thanks a lot to David Morrison. Check his blog out at http://www2.oanow.com/blogs/aublog/ and follow @aublog . BS: Coming off a 4 win season, the Cavs finished just one win away from a spot in the ACC Championship. How good a job has Mike London done in such a short time and how would you assess this season overall? Doug Doughty: Mike London says that he's not an X's and O's guru. He's done a very good job of recruiting but the London recruits didn't have a lot to do with the success this season. He's a positive guy and what he's done is create an environment where the kids want to play for him; plus, he doesn't interfere with his coaches. BS: The offense was balanced and had some success. Who and what makes this offense successful? Doug Doughty:At least up till the past two weeks, the offensive line was doing a great job of creating holes for the RBs and protecting the quarterback (eight sacks allowed in the first nine games). BS: The defense was very good this year, giving up around 20 points a game. What makes this defense work, including some personnel? Doug Doughty: Front four was very good against the run in particular. Middle linebacker Steve Greer (103 tackles) gave them the kind of production they lacked last year (nobody over 65 tackles). I believe they started seven seniors on defense. Doug Doughty: Possibly true freshman WR-KR Darius Jennings. After two lackluster performances to end the regular season, I wouldn't count out RB Perry Jones.